This Rome to Siena sightseeing transfer begins with your English-speaking driver picking your party up at your Rome hotel. Transferring to Florence, you will make a stopover in Siena. 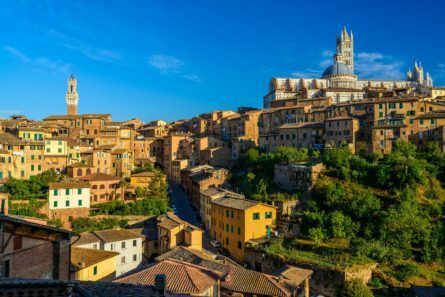 The highly celebrated hilltop town of Siena is the quintessential stop if you are looking to experience authentic Tuscany. On your way to Florence, enjoy a break for a stroll around the charming town at your leisure, or take a walking tour with an expert guide. Marvel at the beauty of classic sites such as Piazza del Campo with its spectacular Palazzo Pubblico, or the magnificent Romanesque and Gothic Duomo. Happily lose yourself in this enchanting town, dowsed in medieval history.